I'm still not entirely sure how stage 6 ended up quite so big. I really didn't have many concrete ideas for it, even as I finished up stage 5. 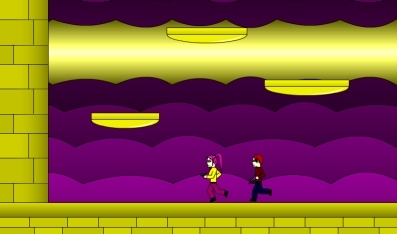 The prison escape sequence was important to complete Avior's transformation from enemy in stage 1 to partner in stage 6. Besides that, I had no idea how the rest of the stage would play out. Since Carina lost her weapons, I knew I wanted to have a big non-linear area that you would have to explore, and kill 3 mini-bosses to regain all of them. 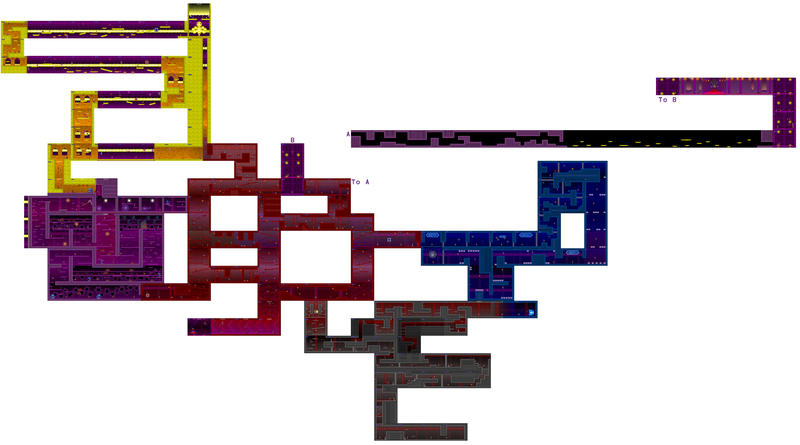 Designing a really complex area like this with three bosses hidden in it would be a pain though, and people would probably get lost. Soon I had the idea of giving the each of the bosses a little side area, so after you killed them you would know not to go back there, that would make designing the central area easier. For the side areas I decided to give them each a little gimmick, rehashing some of the main obstacles from previous stages: the wind in stage 2, the water in stage 4, and the conveyor belts in stage 5. Soon I was thinking of storyline reasons for them to have obstacles like that, giving them unique music tracks, and doubling my initial average size for them from 15 to 30 rooms each. Suddenly, stage 6 was really big. This room technically doesn't exist on the map, but I liked the feel of having Carina and Avior on different levels, so it was crammed in to extend that little moment a bit longer. This area got redone so many times. Initially it was one large outdoor area, and there were no towers. This meant it was possible at points to fall from the top back to the beginning. The wind was also much more frequent than it is now. The wind also would push enemy bullets a bit, making predicting the curvey bullets much more difficult. The wind would also push the winged "angel" enemies around. All of these things combined made the level insanely difficult, so I redesigned the entire thing and significantly toned down the wind effects. Even after redoing the map and enemies though, I still wasn't happy with the area, and redid most of the enemy patterns with a new type added in, the 3 way shot enemy. With them placed specifically in spots that would be difficult to shoot, the area finally had the right balance of difficulty I felt it needed. -Calls back to stage 1 visually and by being a blue "tutorial" area that you get talked through. 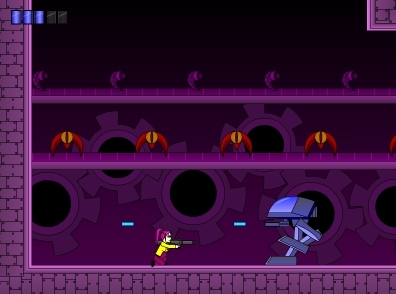 -Lots of aimed shot enemies at once, but still manageable with enhanced jumping ability. -Introduces a new challenge to the player, needing to use multiple weapons. 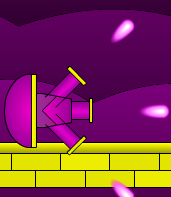 -Low Gravity where you now have the walljump, leading to crazy jumps. Even though this area was first conceived as an area where the conveyor belts would come back as a gameplay element, when I thought of making it Mizar's Lab storyline wise, there ended up being no reason to rehash that element. The room layout here is intentionally really open and flat, all of the other interior areas in stage 6 are pretty narrow and windy. This is the room you first right Wrecking Ball in, then later return to briefly during the escape sequence. I wanted to have a big computer and work station here, to make it really stand out as Mizar's actual room, and as where she had built several of the major bosses from the game. Maybe there could've been blue prints for her final suit on the screen as well! But ultimately because of my lack of artistic ability and wanting to just get the game done already, I never got around to drawing something. Still feels like a missed opportunity. 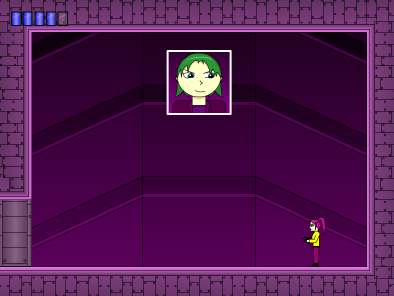 The final scrolling area is the culmination of everything I'd learned making the game. From not being able to do what I wanted with MikeMan 3 years earlier, here I was doing something far beyond what I thought I could ever do, and effortlessly as well. The whole thing came together surprisingly easy, since I had been slowly building towards it with each stage. There were two hiccups though. The first was the lack of being able to backtrack in the later areas, flash was lagging horribly when I tried it, so it was removed from the later areas. The second hiccup was that I had wanted to include a vertically scrolling area, but it ended up being insanely buggy, with enemies falling through platforms every time the screen moved, and the whole thing lagging pretty badly. I decided to s crap that partmove on. 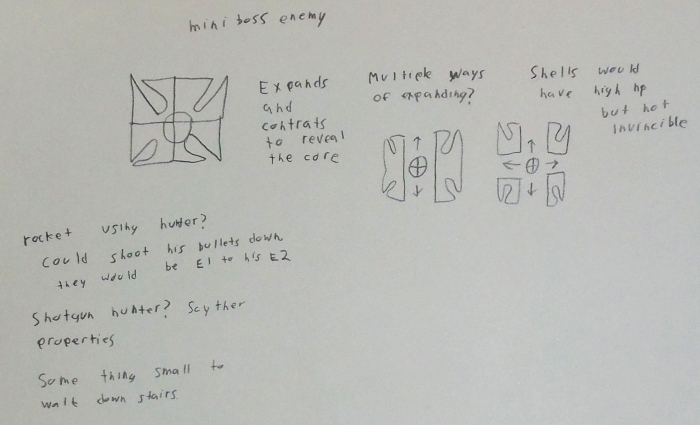 For stage 6 I returned to sketching random enemies in a notebook. The list in the top left is of enemies that could be attributed to Mizar, for inclusion in her area. 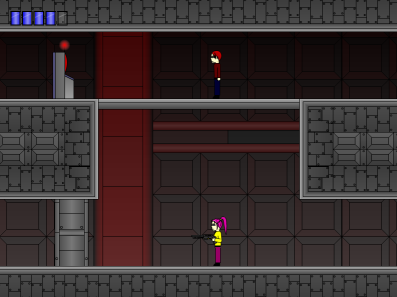 Most of the other enemies here behave as I originally intended, with one major exception. These enemies were actually going to jump around, trying to get directly above you, then firing a bullet straight down at the peak of their jump. This proved to be an insanely annoying pattern so I ditched it. I'm not sure how I came up with the idea of them shooting fire in an arc, but I ended up loving it and keeping them around. The art for the wall climbing enemies was born from an onion skin of the jumping slug enemies. I liked how it looked so much I had to make an enemy out of it. Coding them was quite a pain. They had to bend a lot of the rules like turning around when running into a wall. Instead they rapidly jump up to create the climbing appearance, then reverse their gravity when reaching the edge of a screen. More sketches and notes. The idea of having an enemy built out of several smaller parts had been hanging around since stage 1. In the end though, I didn't even like the final implementation, so they barely appear in the stage. A late addition to the stage 6 enemy crew, I felt I needed a simple small enemy to guard platforms, like the crabs in stage 4, and this guy was born. This boss was quite tricky. I knew I wanted something where Carina and Avior fought it together, but how to make that work I didn't know. My initial idea was to have a circular area where the boss would roll around chasing one of them, and the other would have to get behind it. The way his legs are built entirely out of small orbs is an homage to 16 bit games that would do similar things on large bosses. Since this boss was going to give you the handgun afterwards, I initially kept trying to give him some sort of Electric theme, but that never worked out. He has a few unused attacks, like summoning beams of light, but they didn't really fit with his theme of fast and unrelenting punches. Like the last boss, he's also a retro throwback, in particular themed after Spinderella from Dynamite Headdy, one of my favorite bosses ever. This boss I feel marks the shift from really short intense boss fights, to longer ones with somewhat simpler attacks. Or it could be that I feel this boss has too much HP and is too easy. Who knows. It's certainly a bummer when you die on the rocket form. Wrecking Ball is another boss that seemed like it would be awesome on paper but never quite came together. It's another multiple shape boss like the Fire Guardian, but not as cool, and another chase boss like Stage 4 Mizar, but not as cool. So in the end it's a series of overly simple and bad boss fights strung together. Not that I completely hate this boss, but I think I could've done better with the idea. And now we reach Mizar. Even if the last few bosses were a bit lackluster, I feel I more than made up for it during the final gauntlet. Mizar's animations being so fluid and smooth is a bit of a weird contrast next to Carina, but since Mizar isn't being controlled by a person, it's ok for her moves to have a bit of lag to them. Rough outline for Mizars winged form. Not all of this was used. Final outline for Mizar's winged form. No real deviation from what is in the game now. It was much easier to have all of her attacks be in a set order rather than random, although thinking about it now I wish her attacks were random, it would fit her character more. The initial outline for Alcor. I fully intended on going all out on this boss. There was a running joke between my friends that the final boss needed to have 20 forms to justify how long this game was taking. 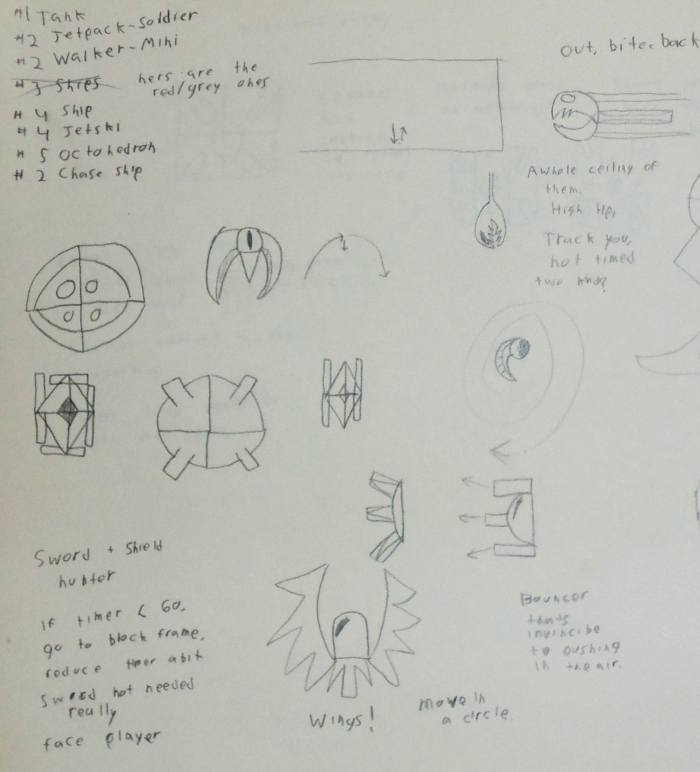 Much more detailed and exact plan for Alcor's first three forms. With a boss of this complexity, I had to know exactly what I was getting into before diving in. Oddly enough, I discovered a huge coding trick when creating form 1-2, which made the rest of the boss fights for the game a lot easier to develop. Even this far into development, I still had not created challenge mode, and instead was trying to make every boss work for every possible special mode. Alcor spends so much time in the air though, Megamode, where you couldn't aim up, was basically unfeasible for him. This and other modes like limited ammo eventually pushed me into creating challenge mode. Interactive flash time! This is how Alcor's Alien form initially looked. I got honestly depressed at this part, since this was such an important boss and I was never good at drawing things like this. I spent a very long time tweaking it into something I eventually liked. With Alcor's alien form finally drawn, I was able to properly plan his attacks out. The orbs, pretty straightforward stuff. I had to create a new system for aiming bullets just for the ice bulelts, where the attacks not only point at you when fired, but then all turn at once. Maybe I'll be able to use that for something else in future games. 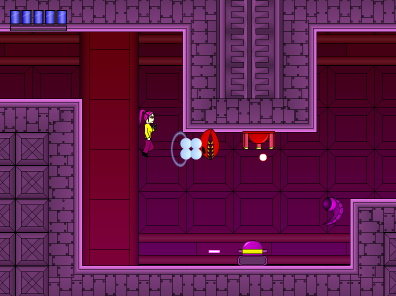 The purple orb was going to be huge, but Circle hitboxes are a pain, so I kept it regular sized. And then in true over the top fashion, after the 8 minute 5 form Alcor fight, after the long escape sequence, comes another boss with another 14 new attacks. Not crazy at all. Mizar's final, FINAL form. I kept this one extremely simple on purpose. Even I knew it would be too much if this form had her flying all over the screen firing lasers and beams at you. Stage 6 has a lot of subtle storyline cues that are probably a bit too oblique. 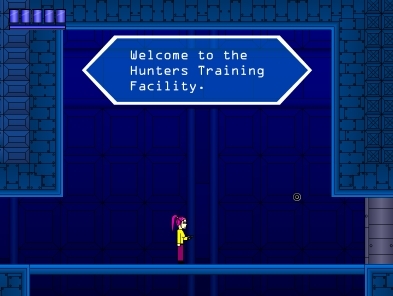 The main thing to notice is how the Hunters base is built on top of one of the Relics, the one containing the yellow orb that Avior started with. Avior was a member of the Hunters, and after realizing how much power was in the orbs, he fled before the others could be recovered. I realize now the story may have been better told from his perspective, if you remove Carina entirely, the stages themselves don't change a whole lot. The game spent too much time keeping the player in the dark, especially the first three stages. Another thing Stage 6 tried to do was bring to was bring the conflict between magic and technology to the forefront, through the characters of Alcor and Mizar. The problem is that even though the game had a few magic elements early on like the occasional giant golem, they're far outnumbered by the technology themed enemies, bosses, and stages. Carina herself was supposed to represent be the balance between the two sides, using her high tech weapons, but also containing the yellow orb inside of herself. Maybe in the sequel she'll get some magic abilities to play up this theme.